More than six years after a tsunami overwhelmed the Fukushima No. 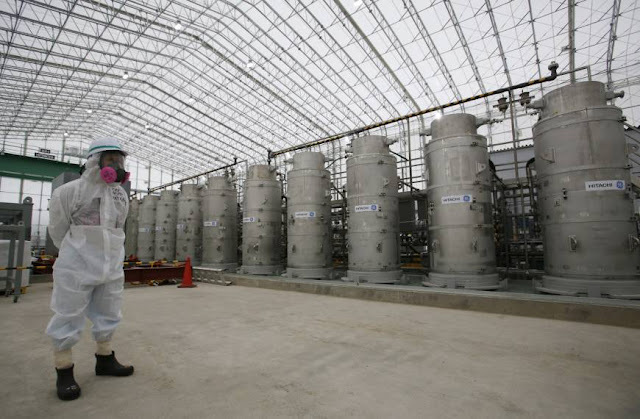 1 nuclear power plant, Japan has yet to reach consensus on what to do with a million tons of radioactive water, stored on site in around 900 large and densely packed tanks that could spill should another major earthquake or tsunami strike. Experts advising the government have urged a gradual release to the Pacific Ocean, while local fishermen and residents are balking. And what about the world? Fukushima’s radioactivity has already spread across the world and releasing more tons of contaminated waters will surely not help to stop the global nuclear cataclysm currently sweeping across our seas. STOP THIS MESS! A Tepco official wearing radioactive protective gear stands in front of Advanced Liquid Processing Systems during a media tour at the Fukushima No. 1 nuclear power plant in November 2014. The Japan Times explains the stalemate is rooted in a fundamental conflict between science and human nature. Experts advising the government have urged a gradual release to the Pacific Ocean. Treatment has removed all the radioactive elements except tritium, which they say is safe in small amounts. Conversely, if the tanks break, their contents could slosh out in an uncontrolled way. Then came March 11, 2011. A magnitude 9 offshore earthquake triggered a tsunami that killed more than 18,000 people along the coast. The quake and massive flooding knocked out power for the cooling systems at the Fukushima nuclear plant. Three of the six reactors had partial meltdowns. Radiation spewed into the air, and highly contaminated water ran into the Pacific. Today, only about half of the region’s 1,000 fishermen go out, and just twice a week because of reduced demand. They participate in a fish testing program. That message isn’t reaching consumers. A survey by the Consumer Affairs Agency in October found that nearly half of Japanese weren’t aware of the tests, and that consumers are more likely to focus on alarming information about possible health impacts in extreme cases, rather than facts about radiation and safety standards. Tatsumi said the stalemate may be further fueling public misconception: Many people believe the water is stored because it’s not safe to release, and they think Fukushima fish is not available because it’s not safe to eat. Storage tanks for contaminated water stand at Tokyo Electric Power Co’s (TEPCO) Fukushima Dai-ichi nuclear power plant in Okuma, Fukushima. The government has still not decided what to do with the water. The water is a costly headache for Tokyo Electric Power Company Holdings Inc., the utility that owns the plant. To reduce the flow, it has dug dozens of wells to pump out groundwater before it reaches the reactor buildings and built an underground “ice wall” of questionable effectiveness by partially freezing the ground around the reactors. 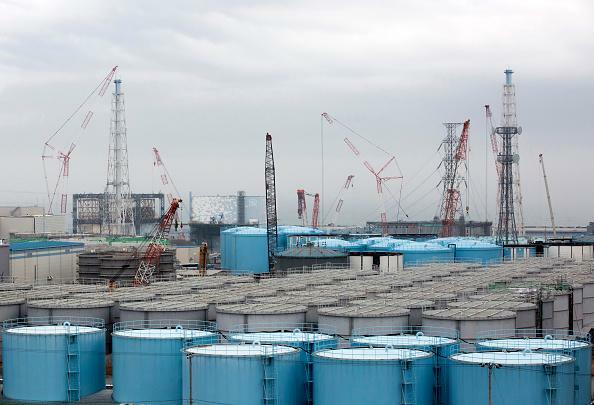 Another government panel recommended last year that the utility, known as Tepco, dilute the water up to about 50 times and release about 400 tons daily to the sea — a process that would take almost a decade to complete. Experts note that the release of tritiated water is allowed at other nuclear plants. Tritiated water from the 1979 Three Mile Island accident in the United States was evaporated, but the amount was much smaller, and still required 10 years of preparation and three more years to complete.